Donkey Kong has traded in his bongos for a Wii Remote and nunchuk - will he still be able to collect all of his coveted bananas or will he make a monkey of himself? 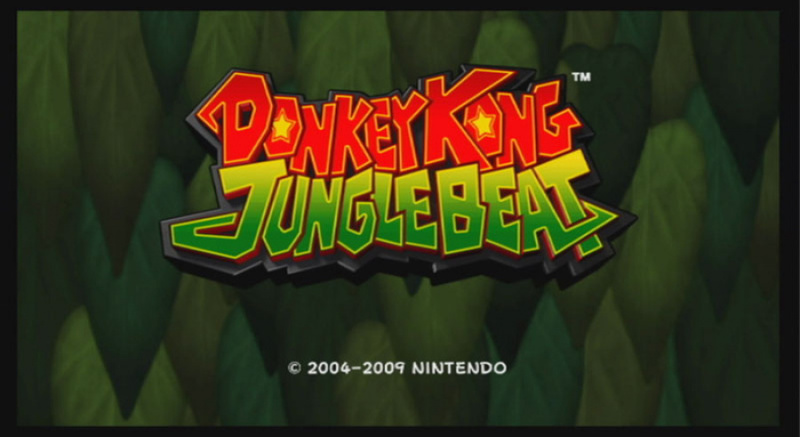 Prior to Super Mario Galaxy, Nintendo EAD Tokyo had their hands full with Donkey Kong Jungle Beat. This title was quite innovative for its time due to its unique control method - the game is played by plugging in a pair of bongos and pounding on them in order to navigate the game’s brilliant levels. Now, the project that was created by Nintendo's incredible Tokyo studio is getting a second chance via the New Play Control! line. While the innovative control scheme has been removed from this remake, the same formula that we’ve come to love is thankfully still present. If you've never played Donkey Kong Jungle Beat before, this is a must-play platformer. And even if you have had the opportunity to get some hands-on time with this game when it was first released, it still might be a wise idea to rediscover it. The new control scheme makes the game feel like a totally new experience; the game has been stripped of DK Bongo support and has been retooled with a more traditional control scheme and motion controls. 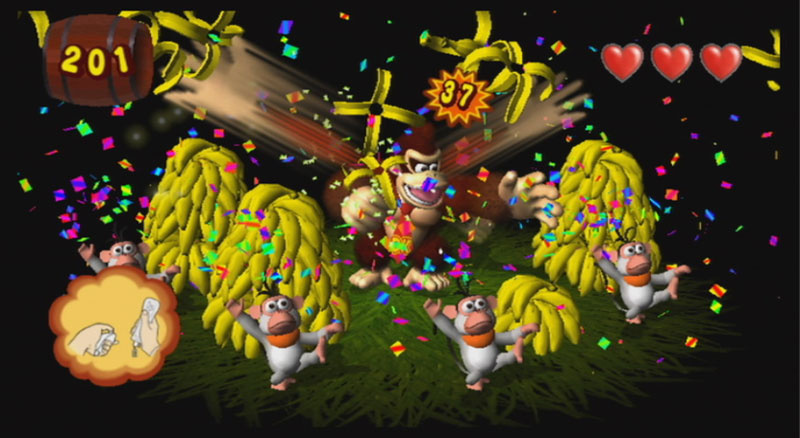 The main objective of the game still remains intact: players control everyone’s favorite overgrown ape as he rampages through creative and obstacle-filled stages. Donkey Kong must explore levels, and at the end of each stage, he’ll earn himself a crown. The trick to all this is that he’s capable of acquiring multipliers for gathering bananas while air bound and for linking together combos without touching the ground. While novices will certainly be capable of blazing through levels, experts will want to explore all of the game’s secrets and experiment a little with the well-conceived and engaging combo system. Donkey Kong will find himself running, jumping, squashing, and pounding as he makes his way through each level, and it certainly feels as though the game was heavily inspired by Rare's excellent Donkey Kong Country series. The amount of attention put onto environments is incredible, as are the little visual embellishments that add to the overall experience. Despite being a remake of a Gamecube game, Jungle Beat still manages to put some developers to shame when it comes to the visuals. It’s pretty hard not to notice all the attention put on the fur-shaded characters, the detailed and vibrant backdrops, the fluid animation, and the constant framerate, which remains silky smooth throughout the game. 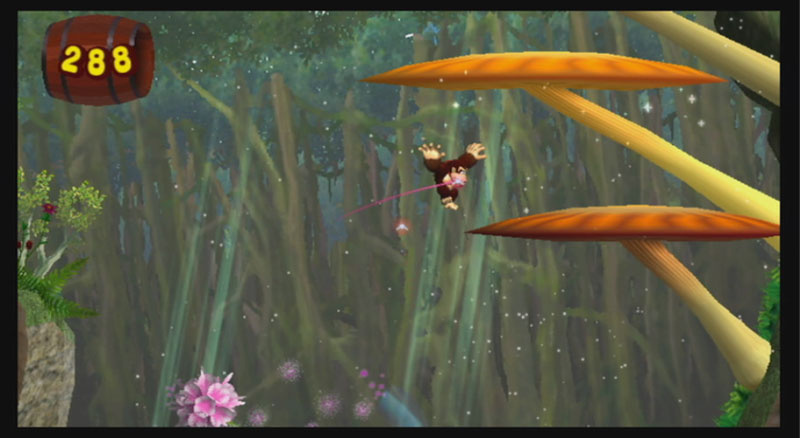 Simply put, Jungle Beat is one of the prettiest games on Wii. With that being said though, the transition from the Gamecube to the Wii certainly has both its ups and downs. Now that Donkey Kong is controlled by the nunchuk’s analog stick instead of a pair of bongos, the game feels a little different than it did four years ago. 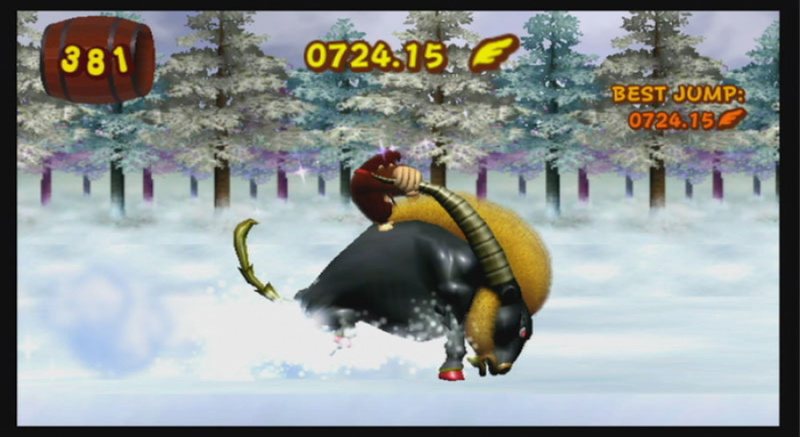 While the direct analog input adds precision to his movements and makes the game a lot easier to play, it almost feels as though the new control method doesn’t exactly live up to the standards set by the Gamecube version in some situations. One such example is boss fights. In the Cube edition, Donkey Kong's powerful punches were tied to the bongos and you literally smashed them to fight. Now though, you make the motions with the Wii Remote and nunchuk, and it’s not nearly as satisfying as it once was. Although the tighter analog controls certainly take away from some of the excitement and enjoyment the original boasted, what Jungle Beat gains is accuracy and familiarity. For newcomers to the franchise, it’s a lot easier to pick up a Wii Remote and nunchuk and jump in on all the action than it is with the bongos. 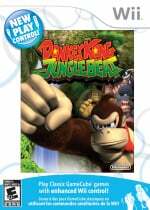 Donkey Kong’s moves are responsive throughout each of the game’s many levels, and even the notriously patchy motion controls work well enough that you won't usually notice any major shortcomings. Above all though, Jungle Beat remains just as fun as it did four years ago. The amount of polish the game boasts is spectacular, as are the incredible level designs and impressive combo system. And while Nintendo has made some changes to some of the levels in order to better accommodate the new control mechanism, there are plenty of challenges. While Jungle Beat proves that change is sometimes good, we'd like to have seen the game allow players to use their old DK Bongos. While the new control scheme works fine, it would be amazing if the ability was there for players to tear up the game’s many worlds the way it was meant to be played. New Play Control! Donkey Kong Jungle Beat is the third title in Nintendo’s new line of 'Wiimakes' and boy, is it good. Everything there was to love about the original can be found here, including a handful of new content. The game excels in practically every department, and while it may only take a couple of hours to complete, it's filled with replay value. The lack of DK Bongo support is unfortunate, but not a deal-breaker. If you missed out on the Gamecube version, you owe it to yourself to pick up this must-play platformer. I've got this here, but I haven't had the chance to play it yet. I think now I'll make time. I got it yesterday , i had the gamecube version years ago, and this is brilliant , Wiiware may be dud at the moment, but with this, klonoa and excitebots the Wii has been great recently. I actually passed on this game when it originally came out because using bongo's to control DK sounded stupid. I think I'll give it a chance this time. The Wii controls sound better to me. I hope this is almost as good as the DKC games but I'm pretty sure nothing will top them. There actually hasn't been too many good DK games recently since Rare left Nintendo. With this and Klonoa I should be in platformer heaven. Sounds good and I missed it first time around. Still torn over which version to get though. I'm sure I'd love the Wii version but the Bongos from the GC version would come in handy for multi-player Donkey Konga. Best New Play Control game yet? Nice review! Seems to echo others about the new control scheme being better outside of boss fights. I'll probably pick this one up. I never played the Gamecube version, but this version is awesome. Glad I bought it. Easier controls? Yes. Using the analog stick feels more natural for experienced gamers, and does make your movement more precise. Better controls? Unfortunately not. A big part of the fun (for me) was using the bongos in Jungle Beat, even though the game was more challenging because of the associated learning curve. Not even providing the option for bongo controls in this version is a real shame. The New Play Control version is still good, but the game was designed around the bongo controllers and suffers slightly without them. However, switching to a more standard controller does make it more accessible - especially to people who aren't open to trying new and different things - so the change is probably worthwhile. That said, if you can find a copy of the original I highly recommend grabbing it instead of the New Play Control version... you might even save a couple dollars doing so! It's a short game. There are unlockable levels that extend the game, and you need to learn how to make combos for big points or else you might never see all the levels. Replay value comes from: (1) being straight up fun, (2) you need to earn medals across all levels to unlock extra content, (3) levels that are designed to promote high-score challenges. That said, if you don't like replaying games after beating them then this should probably be a rental instead of a purchase. Everybody needs to buy this! I had bought it,and this game is loads of fun! One of my favourite Gamecube games. In fact, it is one of my favourite platformers of all time. Significantly better than the Donkey Kong Countries, if you ask me! The bongo's were a cool idea, but they hurt my hands after a level or two. The Wii version sounds better. This game has FILES now? Oh man! OH MAN! @WarioFan: It's been a while since I played the Gamecube version, but may I assume by your comment that it was one of those stupid "one save file per Memory Card" deals? If so, I find that to be a VERY noteworthy improvement, especially given the fact that you can't so easily swap out memory cards so someone else can play their own file on Wii. A fitting review in every way. I liked the Gamecube version, but I think I like this version more because the bongos made things a bit TOO hard and worse, tiring (try going for a high score in 2-1 and you'll know what I mean)! The one thing that confuses me about the game's controls is putting the "grab nearby bananas" on the A button. On Gamecube, that was one of the clapping features, so I've had a bit of trouble not shaking the Wiimote to grab bananas. Small problem, and no problem at all if you've never played it on Gamecube, but still worth a mention, imo. You got it. There was only one file per Jungle Beat. It was games like these that made me buy a 1019 GC Card so I wouldnt have to share with my brothers. 9/10? A bit much Matt. More like an 8. Its certainly a good game, however it is a remake, and despite a good one, not worthy of a 9. Maybe I'm just harsh on games, but when I describe DKJB, I don't say it was "Fantastic", but rather "Great." I believe "Great" corresponds to an 8. I don't know why, but after you guys all merged into NintendoLife I have seen a huge amount of 9s. When a game got a 9 on WWW it was a "Really!? That's awesome, insta-buy!" but now it's more of a "I guess I'll look into it," which is the feeling I got from the 8s at WWW. I agree with the review. This is a fantastic platformer--one of my all time favorites and the best DK game in my opinion. It's more original than the DK Country games or DK 64. If Punch-Out!! wasn't coming out in a week then I'd pick this up for sure. I'm buying this for sure, after Punch-Out!!. I'm of two minds about this. While I do want more people to play this underrated game (and I might even pick it up, even though I have the GCN version), I soooooooooo wish they had just left in DK Bongo support. They had to actively take it out, and it's a worse game because of it!! It was so much fun bashing away at the bongos, that I want to take it out now to play! attractive price.Great game! 8 stars. I already have DKJB on Gamecube. Should I skip this? @ Smashbros99 - Well it all depends on whether or not you want to try out the new control scheme. I found that the new control scheme is miles better than the old one, and as a result I had a lot more fun playing the game this time around. Regardless though, you can't really go wrong seeing as the game is only $29.99. got this when i was on holiday in the US; it's brilliantt10/10...definatly!!! Who cares it doesn't work with the old bongos? If I wanted that, I would've played it on my GCN agian. I want some changes in controls - NEW PLAY CONTROL! provides us this. Why ONM gave this 75% only, I don't know. @LEGEND MARIOID: I wouldn't be surprised if they just reviewed the Gamecube version. This game is awesome. Thanks to Nintendo Life's review I bought this game and I'm so happy I did. I completely overlooked this on the Gamecube - shame on me - but I'm making up for lost time now. I can't recommend this game highly enough. For a while, this was the closest thing to Donkey Kong Country. But now, we've got Donkey Kong Country Returns. Awesome!